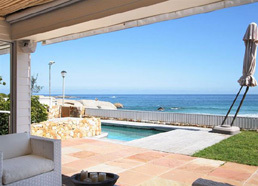 Unbeatable beachside position, gorgeous uninterrupted sea views, Camps Bay golden sunsets, a fabulous pool and the beach literally within a few metres – Glen Beach House offers the most amazingly positioned self catering accommodation for guests seeking a beach holiday in Cape Town. This delightful luxury beach bungalow is situated on the edge of Glen Beach, a beautiful beach cove directly adjacent to Camps Bay beach. Glen Beach is highly popular for its great surfing, and gorgeous white sands ideal for sun-tanning and beach games. 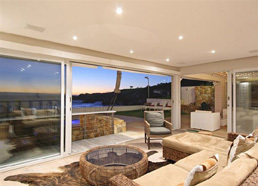 In addition, the vibrant and exciting Camps Bay beachfront with its fabulous array of restaurants, cocktail bars and bistros, is minutes walk from Glen Beach. Glen Beach House itself has recently been completely renovated and is now a spacious double storey beach bungalow. 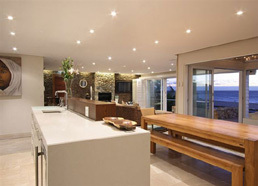 The Main House (being the lower level of the Bungalow) offers 4 bedrooms and 4 bathrooms, sleeping 8 guests in total. 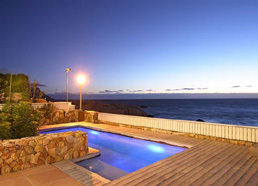 The Main House offers a front garden area with swimming pool which is sea-facing. The Penthouse (being the upper level) offers 2 luxurious bedrooms, both en-suite and is fully equipped, offering gorgeous sea & beach views from the balcony running the length of the front of the Penthouse. There is a private plunge pool to the rear of the Penthouse. A staircase interlinks the Main House and the Penthouse, providing 6 bedroom, 6 bathroom accommodation. In keeping with its relaxed beach-style living, this charming holiday bungalow is minimalist in style yet luxurious and comfortable. The entertainment areas are entirely open plan and boast exquisite sea views through the large floor-to-ceiling windows which line the entire front of the bungalow. What more could one possibly want?